This year, Coro Pittsburgh celebrates 20 years of leadership development in the region. 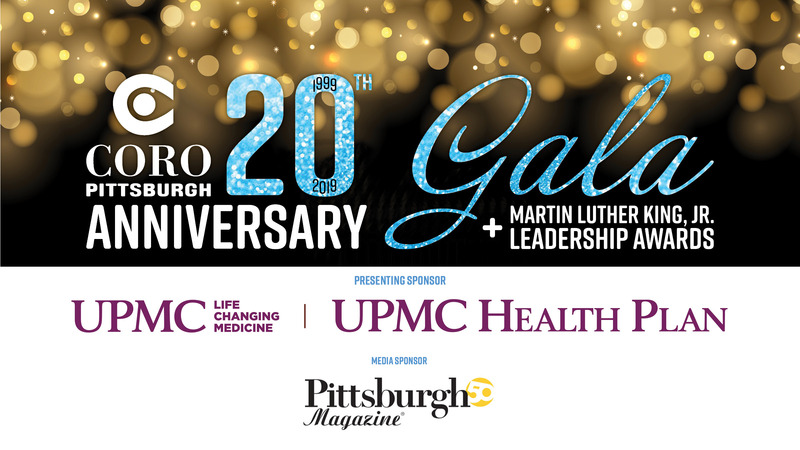 At the 20th Anniversary Gala, Coro will present four MLK, Jr., Leadership Awards: Individual Leadership Award, Coro Alumni Leadership Award, Organizational Leadership Award and a Special Legacy Leadership Award. Awards go to those who have made significant contributions towards the common good by modeling Dr. King’s inclusive approach to leadership. Click HERE for past recipients. Sponsorship promotes your socially responsible brand to a highly diverse audience of 300+ event attendees, 5000+ members of Coro’s network, and local media outlets. Support received helps defray the costs of programs and training provided by the Coro Center for Civic Leadership. Reach out to Mike Baltzer – mbaltzer@coropittsburgh.org – for group rates.